From a castle deep in the remote vastness of Red China comes the most mysterious, the most feared oriental of all time! Some claim he has lived for many centuries-- Others claim he is far more than human! But no one knows the true power of the evil genius of the East--the dreaded Mandarin! With those words in Tales of Suspense #50, the world was introduced to one of Tony Stark's most mighty foes. The Mandarin, one part mad scientist, one part mystic sage, the awesome power he posseses matches the evil in his heart. Wearing his trademark rings, cape and flowing robes (although the outfit has changed over time), he resembles a kind of ancient Chinese Master. And over time he has gone from being a master of science-- whose evil genius rivaled Stark himself --to becoming a mystical shamen intent on destroying technology. 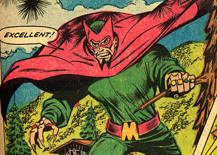 Many consider the Mandarin Tony Stark's arch nemesis and chief advisary. And although his early and later stories set up the dicotomy, episodes in between have relegated Mandy to just another villain in Iron Man's rogues' gallery; impressive, but hardly an arch-enemy. Stark first encountered the Mandarin when he was sent by our military command to find out more about him in the heyday of the Cold War (TOS #50). Dismissed in the West as little more than a fearsome legend, U.S. Intelligence revealed that he was the greatest single power in China, back before the United States even had relations with the sleeping commie giant. In fact, even the most powerful generals in the communist government groveled in front of him in fear. His origin, as explained in TOS #62, is as follows: A tragedy shadowed his birth, an ill-omen. His father, a direct descendant of Genghis Khan, displeased the gods by marrying beneath his station, wedding a high-born English woman. When the Mandarin was born a large idol fell on his father, killing him. When his mother heard the news, she died too. As if that wasn't enough to set Mandy off on the wrong path, he was left to be raised by an aunt, who only wished to get her hands on the family fortune. A bitter woman, she taught him to hate the world as she did. Every bit of gold he had inherited was spent to teach him the sciences of the world, the arts of warfare and the subtle crafts of villainy-- But soon the money was gone. When they could not pay their taxes, they were kicked out of their palace and off of their land. Though poor, this fallen prince did not starve because he had a destiny to fulfill. When his aunt finally died, the Mandarin spent "not one second mourning her." Truly, the blood of Khan flowed in his veins. One day he entered the long forbidden Valley of Spirits. Seeing a glow in the distance, he went closer, coming soon upon the remains of a long dead dragon. Startled, he fell into a ravene. There he uncovered the glistening metal shape of a spaceship. Probbing every secret of the downed ship, which had been there for many years, the Mandarin lost track of time. Soon he found a special helmet that contained the mental log of Axonn-Karr, the dragon pilot from the planet Maklu-4. From the log, Mandy discovered that the ship was powered by 10 rings, whose gems contain unlimited energy. He spent years outfitting a deserted castle within the Valley of the Spirits, studying and mastering the alien science. But donning those rings, one for each finger, Mandarin became the awesome force known today. The Mandarin has long suspected that Tony Stark is Iron Man. He has even unmasked Shellhead twice. The first time occurred after Mandy used a Hulk robot to prove that Stark was IM, only to be tripped up by a mask and the Stark Life Model Decoy when he finally unmasked IM (issues 9-11). 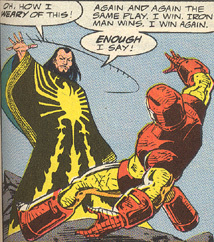 The second unmasking of Tony Stark by the Mandarin came in issue #311, although he lost this info in the end. The Mandarin returned in 241�242 as a Hong Kong businessman named Zhang Tong, a man with a stranglehold on the local business community. He fought Iron Man for the right of SE to do business in Hong Kong�he was so sinister, he even chiseled Tony out of most of the video rights to their battle (70/30 split). But why had the Mandarin changed? Why had the fiendish scientist adopted a new M.O.? Li Fong, a lifelong servant explained: While working to extend the range of his Mento-Intensifier ring, there was an explosion. The Mandarin was left unconscious, virtually comatose. Defenseless, he was now at the mercy of his foes. When the Chinese government came for him, Li Fong secreted him away. They took refuge with the Shan-Tun monks. After being in the monastery for a time, the Mandarin finally awoke. But his mind was . . . smudged. He remembered how to use the rings, but little else. After learning from the monks, meditating, Mandy came to believe that he had gotten the rings from his ancestors�not aliens. Now more mystical, he came to believe that it was his duty to raise China up to be the ruling country of the world. Some of the monks became warriors for his new cause, taking the mysterious name the Hand. Mandarin controlled them with his rings, and they became extensions of his will. Soon, he became involved in business and crime. He quickly came to control the most powerful crime and business cartel in Hong Kong. In the run-up to the second Armor War, in IM #260, the Mandarin had his mind opened by the old wizard Chen Hsu. The old man returned Mandy to China, trained him in ancient ways, and helped him realize his potential. He also introduced him to Fin Fang Foom, who helped Mandy get control of one-third of China in #264. Now the Mandarin finally and fully attained the full potential of the rings in �The Dragon Seed Saga� (IM 270�275). He became embroiled with Fin Fang Foom and his dragon brethren, who wanted the rings back. In the end, he had to team with Iron Man to defeat the ten alien dragons. The full power of the rings was channeled through the Iron Man armor into one massive blast, which saw the end of the dragons. Mandarin�s hands and rings were lost to the four winds in the same terrible explosion. In #307, he returned a changed man�in more ways than one. 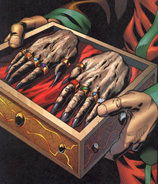 His mangled stumps had grown into mutated dragon hands, and he was on a quest to recover his rings. The rings called to him through some kind of psychic bond�one he neither understood nor questioned�and he found them one by one. After completing his mission, fate directed him to a mysterious castle, and so began �The Hands of the Mandarin� arc (which involved IM 311�312 and several issues of War Machine and Force Works). The castle was an ancient citadel, had been deserted for generations, but it was a place he saw in his dreams during his long recovery. Inside, he found the Heart of Darkness�a giant magical orb. It showed Mandy that all his defeats, his whole life of failure, was by design, and that Iron Man was but the anvil against which he had been tempered like a blade�a process now complete. The Heart of Darkness, also known as the Thuviskaroth of Cataphylaxis, was thought destroyed for more than 20,000 years, but it somehow landed on earth, where it lay untouched for eons. The magic orb is a lens for focusing power from the blackest wells of cosmic evil. Supplemented by the power of Century�s staff, Parallax, it was virtually omnipotent. During this story arc, Mandarin becomes a true devotee of magic. A real mystic, he rejected technology, becoming Iron Man�s true opposite. And with the Heart of Darkness he enveloped China in an anti-technology field that also transformed the country, returning it to simpler times as the vestiges of the modern world disappeared (mighty seaports became medieval fishing villages, etc.). With this dark magic, Mandarin planned to plunge the entire world into darkness, cleansing it of decadent technology with a new Dark Age. Embracing his ancestral ties to Genghis Khan, Mandarin sought to reestablish the old kingdom, the empire of Cathay, with him as the last emperor of earth. The Mandarin had been somehow transformed after the dragon explosion. He was now a nexus, a focal point, for malignancy. And with the orb, the only way to beat him was to change him. Iron Man infected him with a modified strain of the very techo-organic virus that almost killed him. It aged Mandy, but more, it infected him with science, making him unclean before the god of the orb, which rejected him. After a spectacular explosion, he was transformed into a lowly janitor at SE's Hong Kong facility. Other Notable Achievements: He found Ultimo and unleashed him on the world after a quick reprogram, and had a certain Vietnamese Warlord in his employ around the time of Tales of Suspense #39 (making him ultimately responsible for Iron Man's creation). In Volume III, issue #53, we found out that the Mandarin had a son that he left to be raised by monks. With the Mandarin believed to be dead at the time, the son, Temugin, assumed his father's role as the ringed advisary of Iron Man. But he did not prove worthy of his father's mantle. Soon, he created an army of tech-enhanced freaks. He also provided bio-tech weaponry and enhancements to terrorists groups of all kinds, who then became a thorn in the side of the new SHIELD Director, Tony Stark. But this was all part of a much longer gambit. Ol' Mandy soon took the alias Tem Borjigin, the founder and CEO of Prometheus Gentech, Inc., and made a deal with the U.S. government to have Maya Hansen �disappear� so she could work for him on Extremis. He then tricked her into creating an airborne inhaled version. At the same time, Mandarin fooled the Defense Department and Secretary Jack Kooning into paying for it as a super soldier program. What was he up to? After years of meditation, the Mandarin finally realized that the Malukkian rings that gave him his awesome power were not a blessing, that he was not to use them (�I was a fool,� he said at one point). He now believed that the rings perverted his destiny. His destiny wasn�t to rule mankind, it was to elevate mankind. But how? That was the question that vexed him--until he found out about Extremis Enhancile. Now, he wanted to release it. It would kill billions--but millions would live--and they�d be stronger, smarter, and immune to the ravages of ages, disease, virtually immortal. The Great Culling, he called it. And although he knew that he himself would not live through it, would not see this new paradise, he still thought of it as his gift. As Tem, he controlled over 700 companies worldwide, 400 of them inside China. He used these to fast track a weaponized Extremis and load them into missiles. He planned to launch them into a major weather system, seed the clouds, and then have it rain Extremis down on the earth. The result would be billions dead as Extremis killed 97.5 percent of those exposed to it. Fortunately, Iron Man sniffed out the plot and was able to confront him. Major fisticuffs occurred in #26, as the two old foes threw down. Iron Man ended up ripping the rings from Mandy�s spine (Ouch!) and defeating him. And although it appeared that the Mandarin got doused in Extremis--to which he was not immune--and liquid nitrogen, he somehow escaped. His current whereabouts are unknown. Other Weapons:Besides his powerful rings, he has employed all kinds of gadgets and weaponry throughout the years from rays to robots. Hidden studs on his ornate belt operate a scaled-down version of his multi-dimensional teleportation device (which he hasn't needed recently as his rings now seem capable of the same function). At one point he also had an all-seeing crystal globe. This page is copyrighted 2002, 2004, 2006, 2007, 2010 by Tim Rassbach.